Photo Diary: Jamie Curry x Disneyland. After travelling around New York City with Jamie Curry, we headed to Los Angeles - and what better an activity to do than to head for Disneyland for a few days? It’s a fair drive out of central Los Angeles - Uber isn’t super expensive over there! - but definitely worth the drive down to Anaheim. We’d recommend getting a two-day Park Hopper pass, as that gives you the ability to jump back and forth between the main Disneyland Park and California Adventure Park. 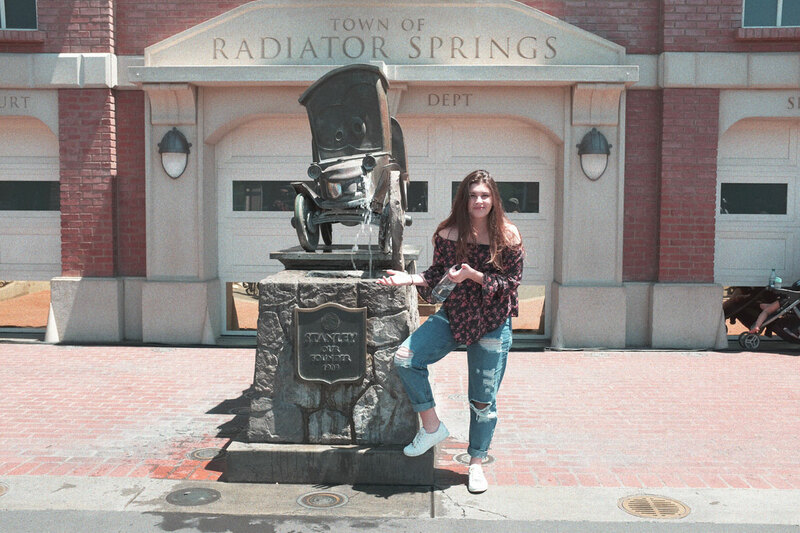 One of our favourite areas in California Adventure Park is their very own Radiator Springs inspired by the ‘Cars’ franchise, which not only looks exactly like the town does in the film, but it also has the best rides! The Radiator Springs Racers ride always has a pretty long line, but if you get early and get a Fast Pass for the ride, it’s definitely worth it. Jamie wears: Denim Overalls and T-Shirt, both Glassons. Though it’s Summer in Los Angeles, it tends to get colder at night, so it’s good to bring some layers of clothing for once the sun goes down. And comfortable shoes are a must - as the enormity of the parks means a LOT of walking. Our second day at the wonderful world of Disney brought us back to Radiator Springs again (mainly so we could ride the Radiator Springs Racers again), but some of our other favourite rides from the trip included the newly opened Guardians Of The Galaxy - Mission: BREAKOUT, Indiana Jones Adventure, and Splash Mountain. Jamie wears: Jeans, Bardot top, Sneakers - all Glassons. Meet / GreetMeet/Greet Interview: Jamie Curry. FashionWin: a $200 Glassons voucher. Fashion5 perfect gifts for Secret Santa. Fashion5 must-have Glassons pieces for February.